Bench Cafe - Innovation at its Finest -- now serving in BGC! Businesses are doing cross-overs! 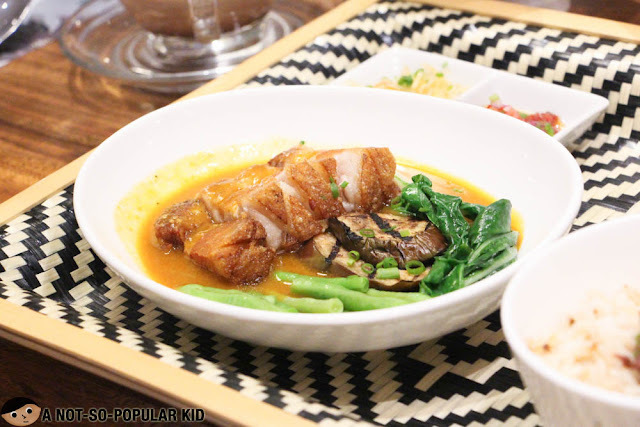 We've first heard about it when Sunnies introduced its own restaurant -- Sunnies Cafe. Now, it's Bench who's going to venture into this awesome world of food! 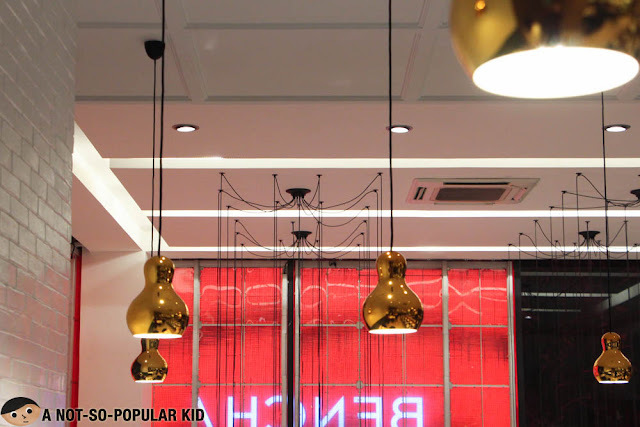 Located in the heart of BGC (i.e. High Street), Bench Cafe sits on the upper level of The Bench Store along the corner of 9th Avenue and Lane O. 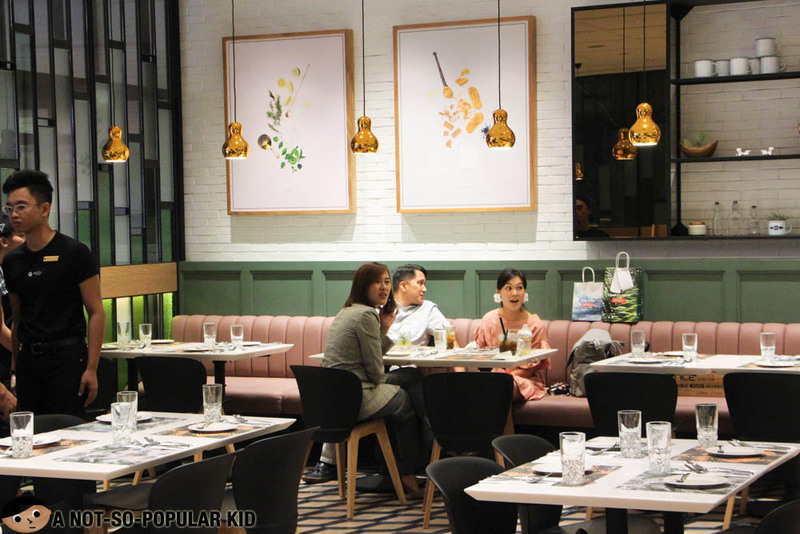 They've recently opened its doors last January 25, and it's now serving Filipino "classy classics". 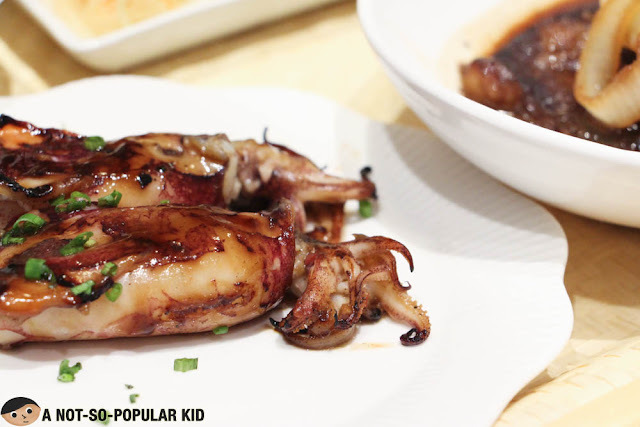 Once you walk up the stairs, you'll be hit by this immense air of sophistication matched with a sense of relaxation, which exactly represents the dishes served -- traditionally comforting yet added with some "classy" twists. 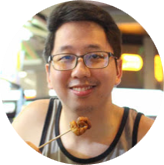 Given that the man behind the menu is Chef Carlo Miguel, we can expect variety of flavors all made with innovative (sometimes crazy) ideas! All for the purpose of providing delight and something new for the palate. 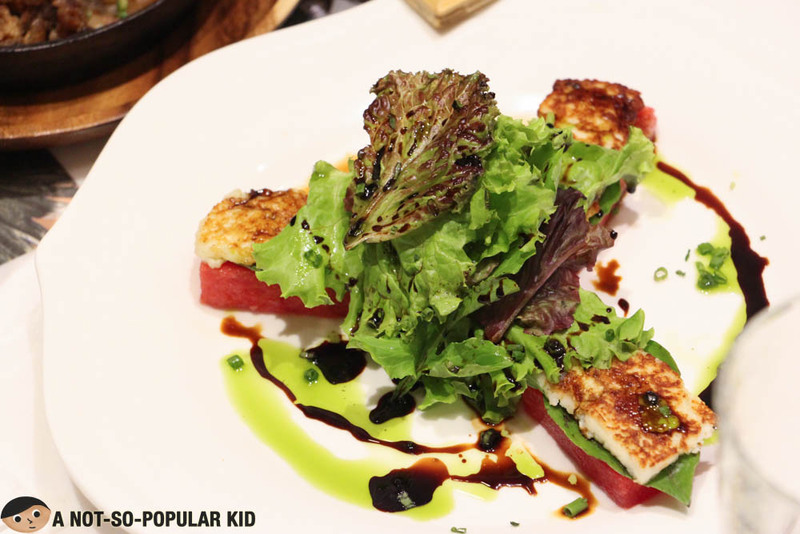 Starting the night with appetizers, we had the Pinoy Caprese (P149) which is a salad of compressed watermelon, kesong puti and basil with drizzles of cane vinegar gastrique. Bite-sized Tinapa Cones (P129) are pure innovation. It's something you probably never tasted yet before. 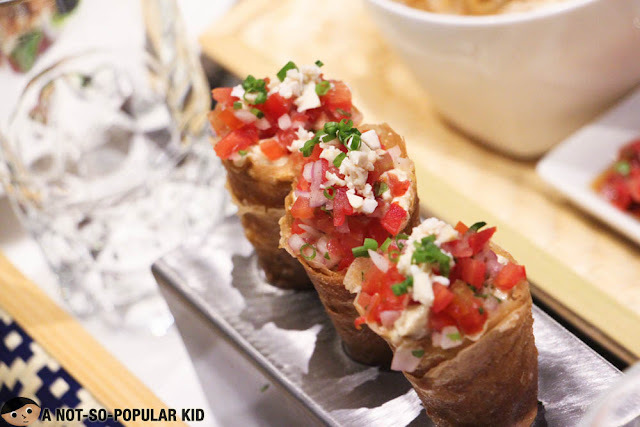 It features a crispy lumpia cones filled with Tinapa mousse and salsa. Each bite explodes with creamy seafood goodness! A must-try! 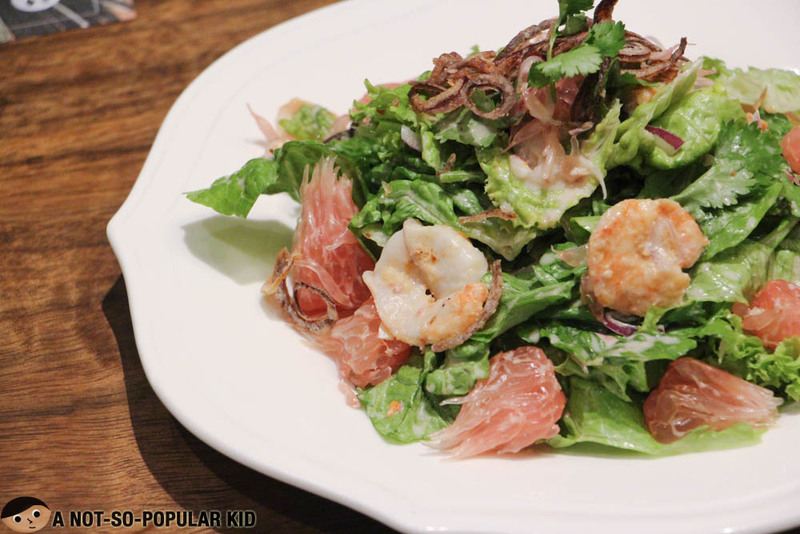 The Shrimp Suha Salad (P239) is a refreshing starter with the combined citrus essence from the pomelo and calamansi dressing. The Sisig Skillet (P189) was a visual spectacle with its intriguing calamansi foam at the middle. It also features the 62° egg to top it! After a festive start, we headed to the main -- the Bench/to! 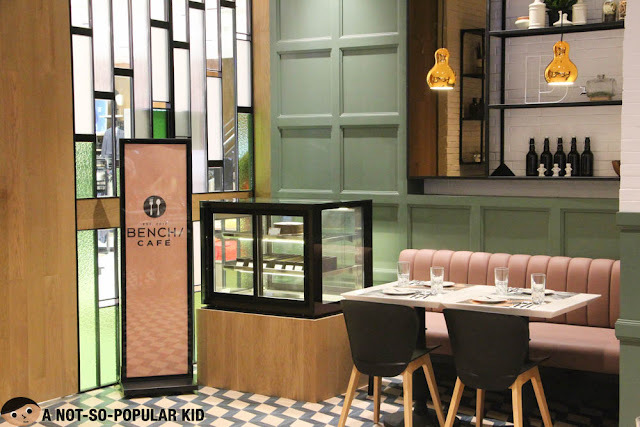 The Bench/to is a concept derived out of the Japanese "bento" boxes wherein all the essentials are there -- soup, veggies, rice and of course the ulam itself. There are currently 10 options to choose from which range from P239 to P439. 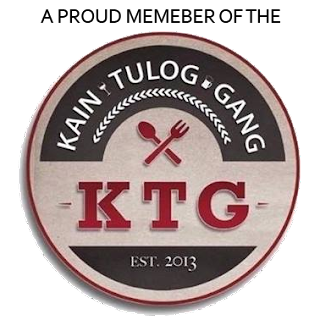 There is inasal, lechon kawali, kaldereta and kare-kare among others. Since I am a huge fan of kare-kare, I decided to engage myself in a "taste test" with the Bench/to # 6 (P389). 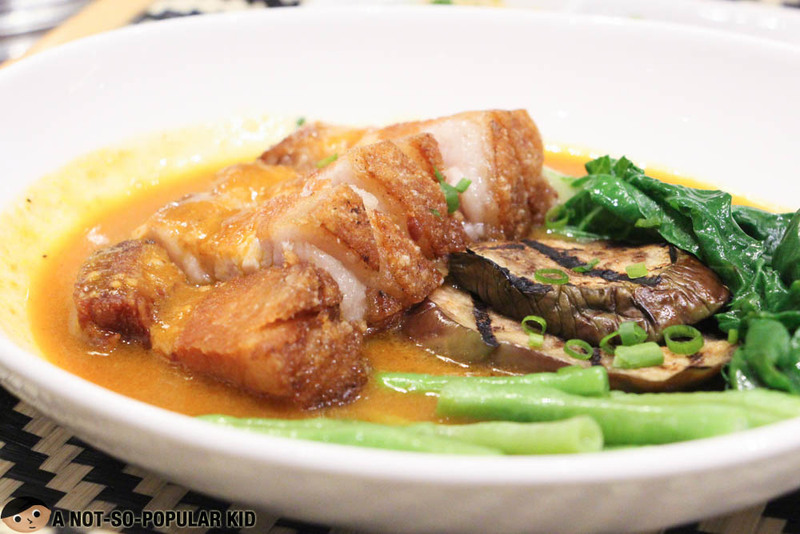 The box includes the Kare-kare, tortang talong, Ifugao rice and soup of the day! Quite hefty, isn't it? The complexity with how the dish was prepared can be seen through the visually enticing plating. Judging by the looks of it, the beef was perhaps boiled then fried to produce a crisp texture. It was also "deconstructed" in a sense that you can see all the components laid out on the plate. Taste-wise, it was pretty balanced and "suave", although I definitely want more of the sauce to be honest. The bagoong here can either glorify the dish further or disappoint, depending on where your palate lies on the spectrum. It can be sharply salty which may give jolt to your buds. Those who are used to "neutral to sweet" type of bagoong can remedy this by getting minuscule portion of it. Bench/to #10 (P439) is an exquisite specialty of the cafe. 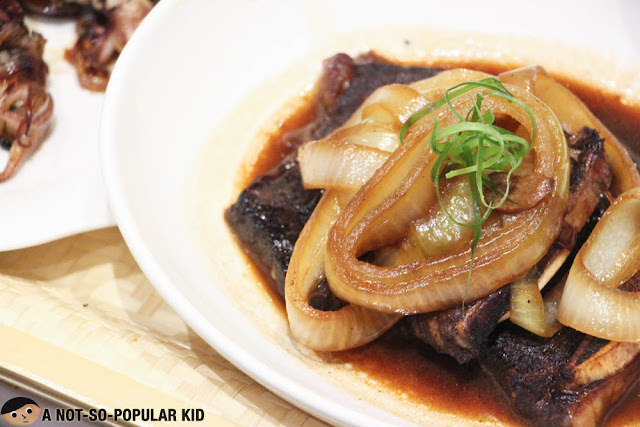 It includes US Angus short ribs bistek, inihaw na pusit, gising-gising, Ifugao rice and soup of the day! 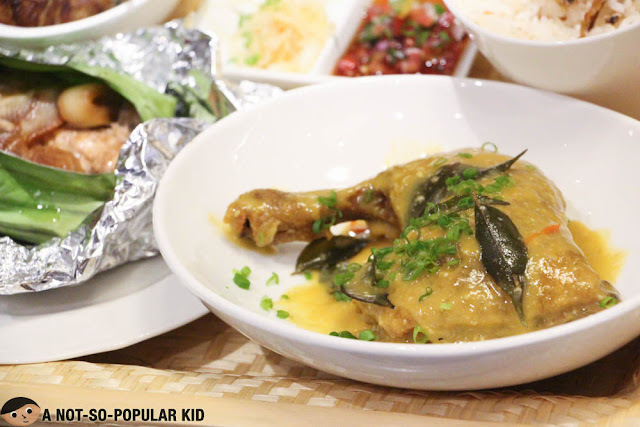 Fans of salted egg dishes can find comfort in Benchto # 7 (P399) which includes Salted Egg fried chicken, pinaputok na bangus belly, tortang talong, Ifugao rice and soup of the day! In case you are still in a "morning mood", Silog dishes are available as well here in Bench Cafe. 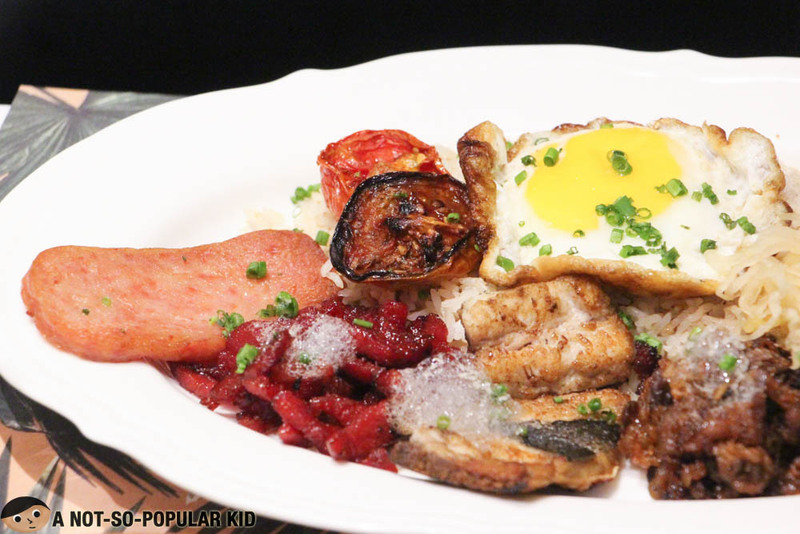 All silog dishes are served with garlic rice, crispy egg, roasted tomato and atsara. You can avail a dish for as low as P139. Bench Cafe offers traditional desserts that are served with "innovation". Prices range from P89 to P185. 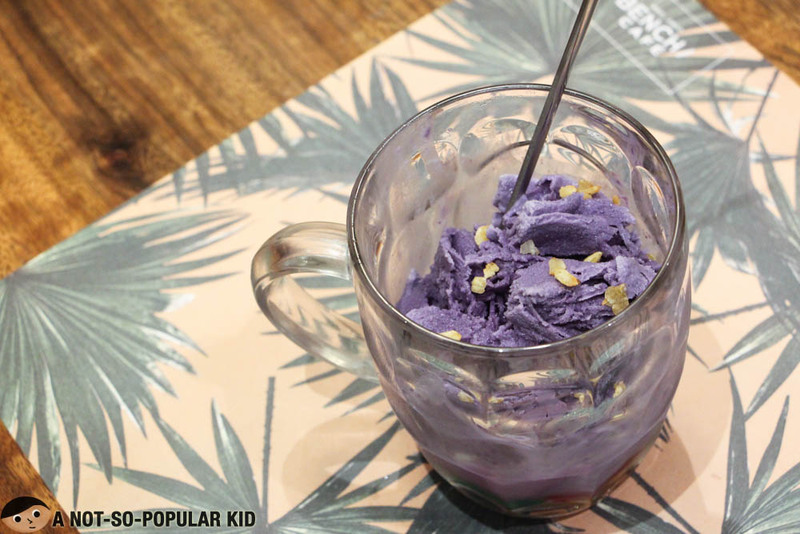 The Ube Halo Halo (P149) was pure bliss! The shaved ice is infused by ube then further made lovelier with macapuno, garbanzos, caramelized banana, leche flan, nata de coco and coconut ice cream. The Flan B (P185) boasts the iconic "B" that stands for Bench. 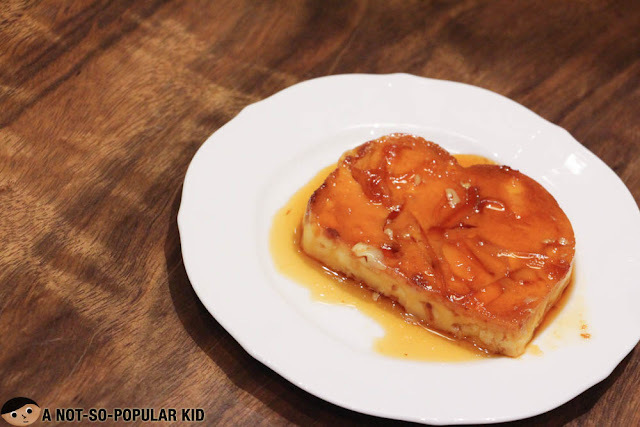 It's not your traditional leche flan because it infuses the macapuno in the mix (as you can visibly see on the photo above). With its rightly creamy texture (i.e. not too thick consistency), it definitely can delight a broader spectrum. 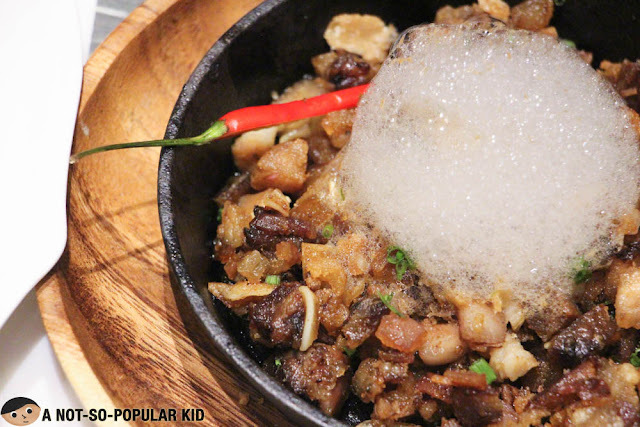 If you feel tired of the traditional Filipino dishes, you can check Bench Cafe out. You'll love the comforting ambiance together with the smart innovation on the dishes. Food served definitely brings back your enthusiasm over our own cuisine. See and taste for yourself! PS: You can shop as you wait for your food to be served.